We have a derby favorite. What a horse. Triple Crown contender. Extragear wrote: We have a derby favorite. What a horse. Triple Crown contender. oh Christ, don't jinx the poor guy! TC, already? Did not say he would win, just said contender. He is not some 3 race horse going into Derby. Plenty of foundation. I like what that connection said during the broadcast when asked if he has the best 3yo in the country right now (Chrome): "when you start to get cocky, life kicks you in the teeth." Let's just hope he gets to the Derby in one piece! For the love of all that is holy, please don't jinx this horse. Bill Dwyer of the LA Times. I'm sure there will be more like this coming. The PETA video story will rise again Derby week. The story of this fine animal and his connections are a better counter point then I every would have dreamed of. Fairy tale stuff. It appears that we're somewhat united in our bated breath hopes for this horse. He does make the heart quicken - a chestnut with a white blaze. No jinxing - just a wish - please, the powers that be, let him get to the Derby starting gate sound and even more improved after his jaw dropping victory yesterday. Two weeks before California Chrome was born, co-owner Steve Coburn had a dream about the pending foal out of his mare Love the Chase. "I told my wife, 'It's going to be a colt. He's going to be flashy with four white stocking feet and a big bald face,' and his baby pictures look just like that," Coburn said. "I told them he was going to be something special." Its kind of mind boggling how much hype there is for a horse that is way over-rated. Let's state just how little he has beaten. In both his graded stakes wins against open company the last two races, he raced against a total of 13 horses. Ten of those were maidens or just maiden winners. No wonder why he crushed the field yesterday. Its deceiving. Who has he beaten? Hopportunity was the only horse he beat that is quality. And that one mainly ran to get a workout and will beat him in the Derby. I'm so glad he won by daylight yesterday. It will provide greater value for others that are better horses. I will not use him on any of my tickets for the derby. Santa Anita is another, just like Gulfstream, with a huge speed bias. No horses can close. HardSpun32 wrote: Its kind of mind boggling how much hype there is for a horse that is way over-rated. Let's state just how little he has beaten. Plenty of faults with your post. First, his CONSISTENT thorograph numbers say he is a freak. These are not beyers which are all over the place, but thorographs. Second, Hoppertunity came east and won a stake and was no match for him. He is beating very good horses easily. Third, he has a foundation. This is not a horse that is just good at the right time. He has been good for months. I think his biggest threat will be Social Inclusion and Constitution in the Preakness. He seems to good to lose the Derby and probably will be 8-5. Awfully cute video of him during his first year on Youtube. He was such a big, fat yearling! My hear goes pitter pat when I look at him -- I think the best term for this is "emotionally compromised". Extragear wrote: Second, Hoppertunity came east and won a stake and was no match for him. He is beating very good horses easily. Third, he has a foundation. This is not a horse that is just good at the right time. He has been good for months. I'm going with the impression that Baffert had nothing to gain by winning the race with Hopportunity. I don't think he wanted to have the horse go into the Derby off a 7-week layoff, never racing beyond 1 1/16 Miles. He got exactly what he wanted out of the race. And the jockey was never really full out on the horse. I'm going with the impression that his great efforts the past few months have been because of inferior competition. Admin wrote: Sometimes you just have to see what's in front of you. This is one of those times. That was a very strong performance, snagging the lead in 1:35 flat and then continuing on strong to the wire. You're free to bet who you would like for the Derby, and it's easier to be correct in a prediction that a horse will lose rather than win the Derby, but you're underestimating how good this colt is. I certainly could be wrong in under-estimating his talent. I just want to see him duplicate this against a more quality field and on a track without a speed bias. All his great numbers could be inflated. Had he done this at Oaklawn or Aqueduct, I would be more impressed. Horses always look like superstars when they face inferior competition. But not only do I think he'll lose, I don't even think he'll hit the board. Who would that be in your humble opinion? Did I say you said he'd win?? No, I said mentioning the TC before the Derby is even run is a tad premature. Some would say it's a jinx...if you believe in those types of things. Sometimes you just have to see what's in front of you. This is one of those times. That was a very strong performance, snagging the lead in 1:35 flat and then continuing on strong to the wire. This horse will be the favorite in the Derby,but with all the speed looking to break from the gate May 3rd,he's gonna be a bet against for me too.I think he's a really nice horse,and will win many big races this year,but I was more impressed with Wicked Strong yesterday.I don't see a forwardly placed horse winning this years Derby the way it is shaping up. Horses were closing just fine at SA yesterday, and it's not like he had the quintessential speed bias trip (in first on the rail). I understand the desire to see him race elsewhere, but his tactical abilities and devastating stretch acceleration seems to set him apart from the Brother Dereks and Sidney's Candys of the past. The fact that this forum is so united in supporting him is also unusual- I can't think of a recent comparison. Chrome isn't a shoe-in and shouldn't be treated as such, but he's a very deserving favorite and a very exciting horse to watch. Judging from here and on Twitter, it looks like Hoppertunity will be the wise guy horse based mostly on his gallop outs (although how one can conclude anything from him gallop out vs. Chrome's yesterday escapes me). He's a quality horse and he ran better than expected yesterday, but I've learned not to trust Baffert Derby horses if he doesn't talk them up before the race. I think it's important to stay cognizant of these kinds of things. There's such incredible haste this time of year to anoint every impressive winner. 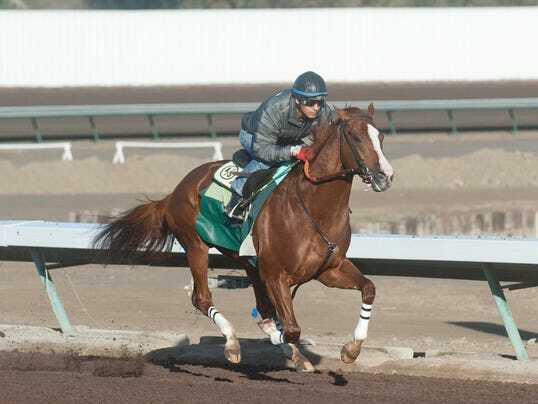 California Chrome is a really, really good horse. But, he's in a vacuum. Yes, he walloped Hoppertunity yesterday. He did so with a perfect pace-stalking trip (moderate middle fractions) over a racetrack he LOVES. Hoppertunity was making his 3rd start in six weeks off a taxing effort at Oaklawn and finished up well to be second. Will CC be able to get a trip that's even remotely close to that in the Derby? Only if every speed horse gets left in the gate. His trainer, while certainly a competent horseman, NEVER ships. The Derby is going to be an incredible test, and you will have to take him as the favorite in the most wide-open race of the year. There's reason to be excited about betting against him. Barnfour wrote: I was more impressed with Wicked Strong yesterday.I don't see a forwardly placed horse winning this years Derby the way it is shaping up. Wicked Strong spent half the stretch rubbernecking at the crowd. I don't know if that's a factor in his favour or against it. I HOPE he doesn't wind up being one of those horses that only do well in California.